Described as a refrigerator or freezer which maintains a temperature of few degrees above the freezing point of water, a similar device which maintains a temperature below the freezing point of water is called a "freezer." 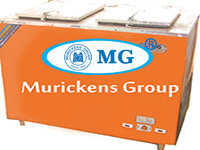 MG Deep Freezer is leading product of Muricken's Group which manufactured for the provision of power saver products. Our other cooler series are deep freezers, combinated freezers and MG branded refrigerator. The equipment that is used to cool, extracts heat, or maintains temperature. Keeping house hold items like ice-crème, meat, fish, vegetables, frozen food, cool drinks with natural taste in MG freezer which helps to save our money and time. The main attraction is low power consumption, sound proof and kept well space managed device. The refrigerator is relatively modern invention among kitchen appliances. It replaced the icebox, which had been a common Household appliance for almost a century and a half prior. For this reason, a refrigerator is sometimes referred to as an "icebox". Consumption which is proved from 1992 in Kerala market. ► Low power consumption (1 to 2.5 units per day).► The main advantage is choice of door for water/milk cooler or freezer in single freezer ( 3-in-one ). ► Maintenance free system based on American technology.► PUF System.Light weight.► Fully automatic.► Uniform cooling guaranteed by using copper capillaries.► ISO: 9001 -2015 Certified product.► Fast freezing .► Special design retains cooling for a longer period during power failures.► Special design and technology ensures longer compressor life and uniform performance throughout the lifespan. ► Separate containers.► Single, double, triple door or four door.► Galvanized steel sheet outer body. ► Top cover and door Pure steel. ► Special model can reach up to minus 40oC.► Body condensing and no extra condenser unit/condenser cooling fan.► Compact in size and attractive color.► Wheel mounted if needed.► Power and cut off indicator.► Adjustable thermostat (range -30 to -20) or digital meter.► Provision for inner partition.► Special model for sharja shake business.